How to install Quickstart package? Akeeba Backup is the most popular Joomla! 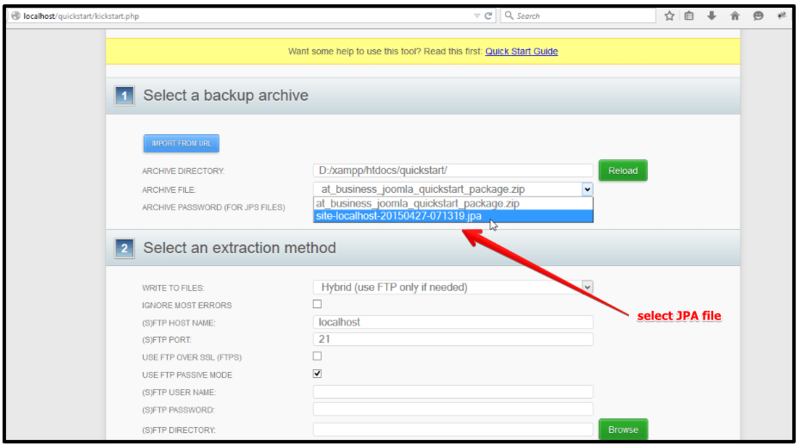 extension for backup and restore Joomla! website. 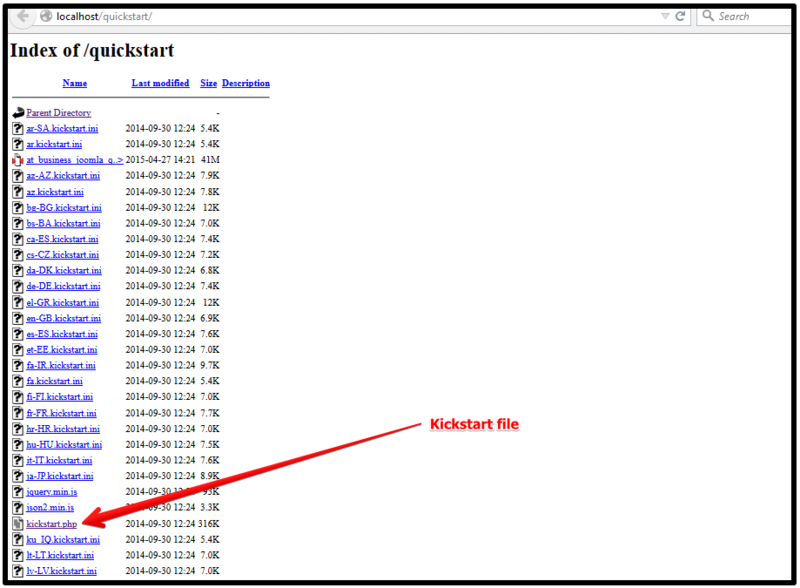 In this blog, I will intro you about how to install Quickstart Package that using Akeeba Backup and Kickstart files. After download it, you unzip the package and you will see three sub packages includes AT Business Template Install Package, AT Business Quickstart package and the Documentation. The installation process is easy and requires just a few clicks. You won’t need any coding or design skills to install a fully-functional Akeeba kickstart within minutes. 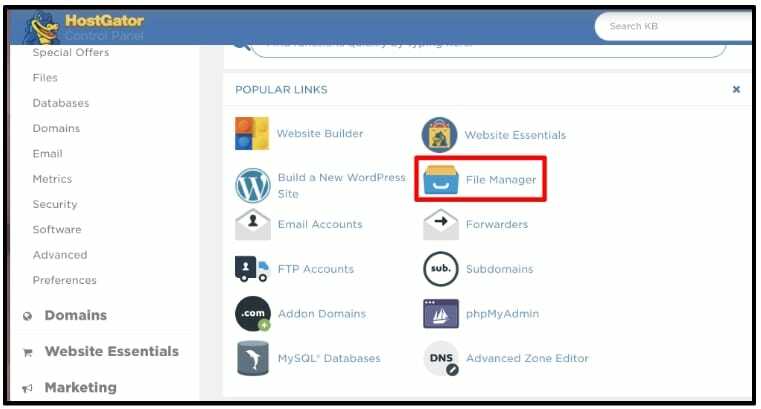 If your hosting support cPanel (such as Hostgator.com), you can go to cPanel > File Manager, go to your website folder and upload theme Quickstart files. 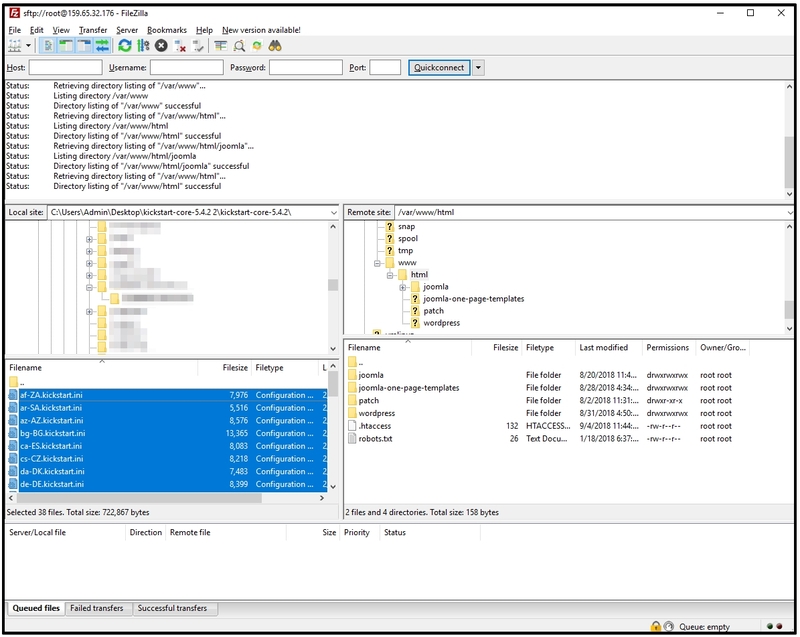 Create new database for your website via Database Manager in Hosting controls. If you don’t know how to create database, just read hosting user guides or contact hosting support staff. Installing quickstart package on the local host is straightforward but can be tricky the first time you attempt it. So for this step we’ve provided instructions on how to do it right from scratch. Now, in order to run quickstart package, you need not only a web server, but also 2 more things: PHP script interpreter and MySQL database system. It sounds complicated but thankfully, there is a single package called XAMPP with all the elements included. Let’s install XAMPP on your computer. Run the installation file as you do with regular software and follow the step by step instructions. 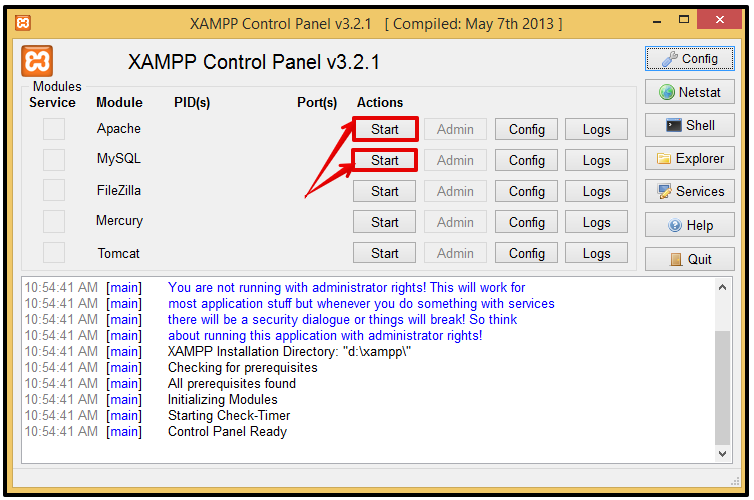 Open “XAMPP Control Panel Application” and start “Apache” and “MySQL”. That’s it, your localhost is now installed. You can check if it works or not by typing the address: “http://localhost” in your web browser. You should see a page as illustrated below. 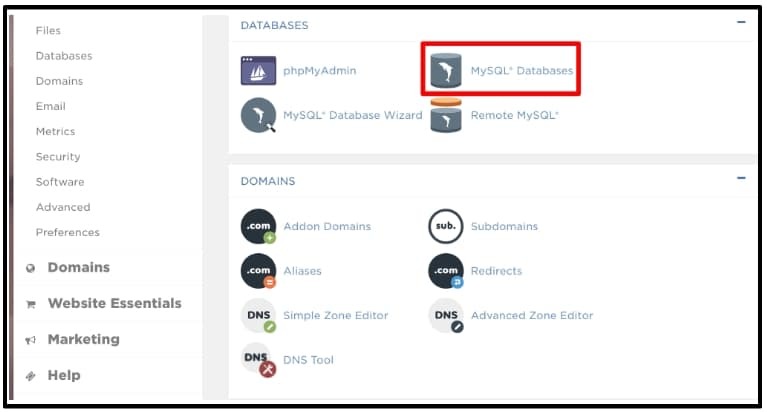 Step 2: Create a database in phpMyAdmin. From the XAMPP interface, click phpMyAdmin to start creating the database. Now you are ready to install quickstart package. Step3: Create a new folder in older “htdocs” in the XAMPP folder. – Create a new folder entitled “test-quickstart” in folder “Test” in folder “htdocs” in XAMPP folder. Normally it will be located at “C:\xampp\htdocs”. – Unpack the downloaded package file into the folder “test-quickstart”. – Go to the URL “http://localhost/Test/test-quickstart”. – If you got 500 error when you run it, please change permission for all Quickstart files and try again. – If you got 404 not found when you run it, please recheck folder that you uploaded, it might be uploaded to the wrong folder in your hosting. 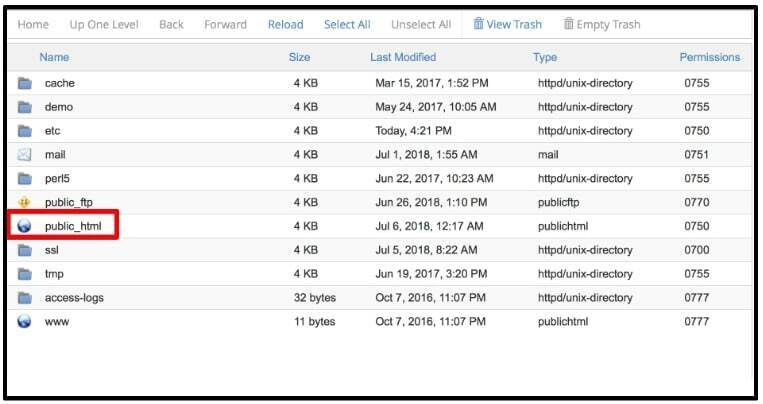 In Install Panel, please select the backup file, it’s JPA file format (.jpa), not select or use default ZIP (.zip) file. – If you got ‘Wrong Files’ after this step, so you select ZIP (.zip) file instead for correct JPA (.jpa) file, so just back to Install panel and re-select JPA (.jpa) file. – If you got an error that ‘Can’t Extract File’, so you should use other methods to extract it. Default extra method in kickstart tool use ‘Hybrid (use FTP only if needed)’, but in some case, if your hosting does not accept it, just use ‘Directly’ method instead, you can select it via ‘Write to files’. After extracted files, you just click to button ‘Run the Installer’ to go to the next step. * In some cases, if you have different PHP version, you will get a warning message above, but don’t worry, it’s fine! Enter your database information such as database server hostname (default is localhost), database username, database password, database name, database prefix, etc. P/S: “Allow UTF8MB4 auto-detection” unchecked. After entering your info, click ‘Next’, if you put all correct info, so it will appear a message ‘The Database Restoration Successfully’. Otherwise, it will appear a message about ‘Can not connect database’, so you should recheck database information. 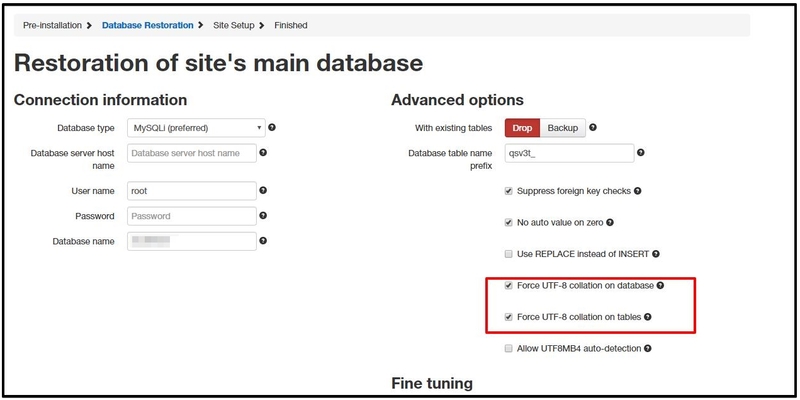 After you restored database successfully, you will go to the next step to put your site info such as Site Name, email, option ‘Live Site URL’ should be left as blank. In part ‘Supper User Settings’, you need to define new username and password for administrator account. I recommend you should enter new password. Just leave blank for ‘FTP Layer Options’ and ‘Directories fine-tuning’. Yes, this step is last step to process install Quickstart, just click to button ‘Clean Up’ to clear up Kickstart files which includes in backup by default. It will make your source clearly. Also with file backup ‘.jpa’. Just click to button ‘View your site’s front-end’ and ‘view your site’s back-end’. *** If when you log in but it doesn’t work and doesn’t have an error message, just open file “configuration.php” (located at the root of your source c0de)and search for the string “$cookie_domain”, then just leave blank for this option. Normally, when you got this problem, it caused by your domain cookie that you put. So, just leave it blank as the default setting for this option. 2. If you changed Supper User Settings during install Quickstart package (Step 4), you must use that login info. 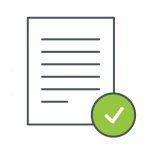 If you forgot it, you can see this instruction how to restore Joomla! password. Akeeba Backup is really useful software that helping to create Backup and Restore easily. 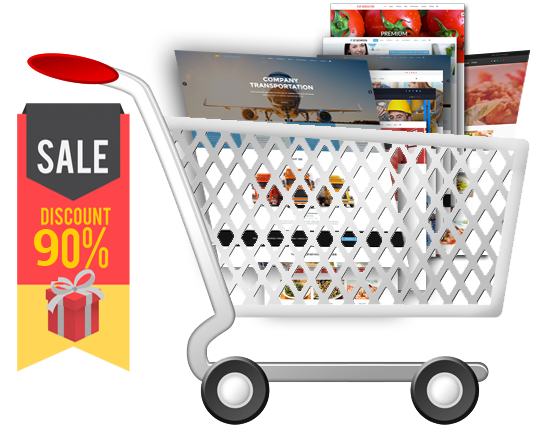 Most of the template provider use this method instead for default Joomla! quickstart package. Because in some hosting config, you will have problem with Joomla! installation, but Akeeba Backup and Kickstart can solve it. Thank you very much for the powerful tool Akeeba!